i Click 'view all' to instantly compare this good deal with offers on other top mattress protectors twin extra long. 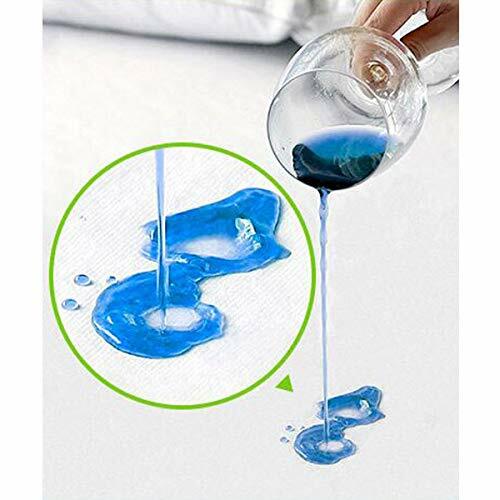 Dreambeauty Twin-XL Fitted Waterproof Mattress Protector Hypoallergenic is currently selling at $21.33, which is its normal price. It has a lowest price of $20.99 and is selling within its usual range. Price volatility is 0.45% (meaning it does not change often), so the price should stay low for a while. Until then this is a recommended 'good deal'. 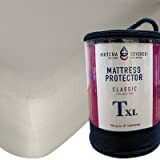 Compare the current price, savings (in dollars & percent) and Buy Ratings for the top Mattress Protectors Twin Extra Long that are closely related to Dreambeauty Twin-XL Fitted Waterproof Mattress Protector Hypoallergenic. Here is how Dreambeauty Twin-XL Fitted Waterproof Mattress Protector Hypoallergenic compares with other leading Mattress Protectors Twin Extra Long. Welcome to Dreambeatuy Store, we will offer you the best quality products and services, If you have any problems just come to us freely, you will always be satisfied! 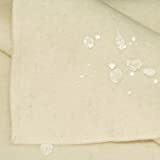 Hypoallergenic, quiet, and waterproof (yet breathable), the mattress protector offers undetectable performance and makes an excellent choice for anyone with pets, kids, incontinence, allergies, or asthma. 80% Cotton/ 20% Polyester terry surface. 100% Waterproof and breathable PU layer. Registered With The FDA As A Class 1 Medical Device. Ultra-Thin design is breathable, quiet and sleeps cool without changing the feel of your mattress. Twin XL size: 39" x 80"(99cm x 203cm) , Fits up to 14" deep mattress. With its fitted-sheet-style design, the mattress protector accommodates any type of mattress, like memory foam, latex, or innerspring, and mattresses up to 18 inches thick, including extra-deep pillow-top mattresses or mattresses with a foam topper. The mattress protector offers user-friendly placement, and it stays put, even when shifting or rolling over while sleeping thanks to its elastic band all along the side skirt that pulls any excess material tightly under the mattress. Best of all, the mattress protector won't change the feel of your mattress. Machine-wash the mattress protector with your sheets using normal household detergents that do not contain bleach. Tumble dry on low heat together with bed sheets, towels or other clothing. FeaturesFDA Registered: 80% Cotton/ 20% Polyester. 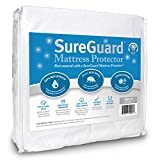 Registered With The FDA As A Class 1 Medical Device.Twin XL size(39"x 80") mattress protector, fits any type of mattress up to 14 inches deep.TPU Certified by SGS, products quality are proved to be guaranteed, and free of PVC, vinyl, phthalates, fire retardants and other toxic chemicals, it can also guarantee the healthy sleep of you and your family.Hypoallergenic cotton-terry surface; 100% Waterproof, Breathable, Quiet membrane barrier. Protects mattress from dust mites, allergens, bacteria, and liquid spills. Great for those with Kids, Pets, Allergies, Asthma, Eczema Or Incontinence.